Dr. Erika LeBaron is a licensed osteopathic physician board certified in family medicine and osteopathic manipulative treatment. She earned her Doctor of Osteopathic Medicine degree from Texas College of Osteopathic Medicine in Fort Worth, Texas. She completed an internship in family medicine at Conroe Medical Center and Lone Star Family Medicine in Conroe, Texas. She then finished her residency in family medicine at University Hospitals Richmond Medical Center in Richmond Heights, OH. During residency she had the opportunity to spend a month of training at the Center for Integrative Medicine at the University of Arizona with Dr. Andrew Weil and his nationally recognized program. Along with her osteopathic manipulative treatment skills (OMT) as an osteopathic physician she has done additional focused training in musculoskeletal and sports medicine interventions including dry needling, trigger point injections, various joint injections as well as training in prolotherapy, a regenerative injection therapy for treating ligaments, tendons and joints. Training in these various modalities enables Dr. LeBaron to provide non-surgical interventions for patient’s muscle and joint pain. In addition to her medical training in traditional medical interventions, she has also done specialized training in bioidentical hormone therapy, Wilson’s temperature syndrome, thyroid imbalance and restorative medicine. 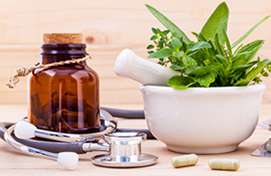 The goal is to restore each patient to their optimal level of health by taking an integrative approach using nutrition, herbals, bioidentical hormones and lifestyle adjustments along with traditional medical as well as other complimentary therapies to work with the body’s God-given ability to heal and regain balance if provided with the needed resources. Dr. LeBaron also holds a master’s degree in psychiatric/mental health nursing and completed post graduate work in family therapy. She has many years of experience in this field prior to her career in medicine. This experience allows her a unique perspective on the psychological aspect of illness and pain and its impact on you and on your significant others. Her years of working with patients in this field also make her an avid listener to hear what her patients have to say. She believes that it is of utmost importance for her patient’s to be heard and understood and that this is a key component of personalized medical care.